With my upcoming trip to the sunshine state quickly approaching (!!) I have been slowly but surely been getting together everything I'll be needing for some much needed fun in the sun. 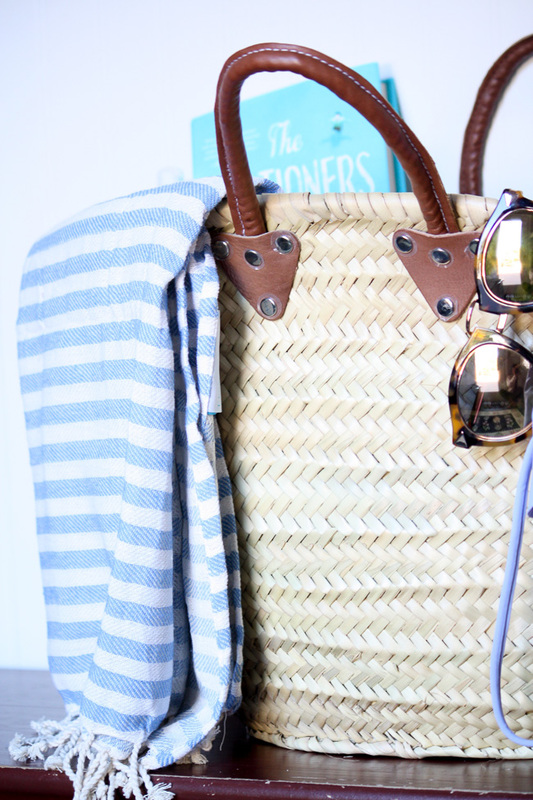 For any trip involving the beach or a pool for that matter, a good beach bag is key. 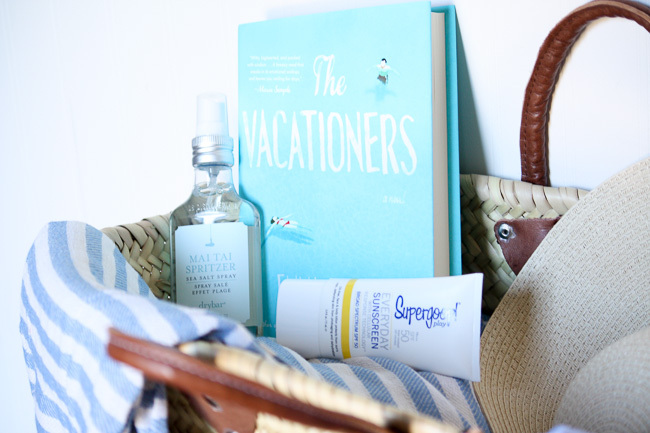 Of course, the contents inside are equally important, if not more so, for making the most of a seaside getaway! 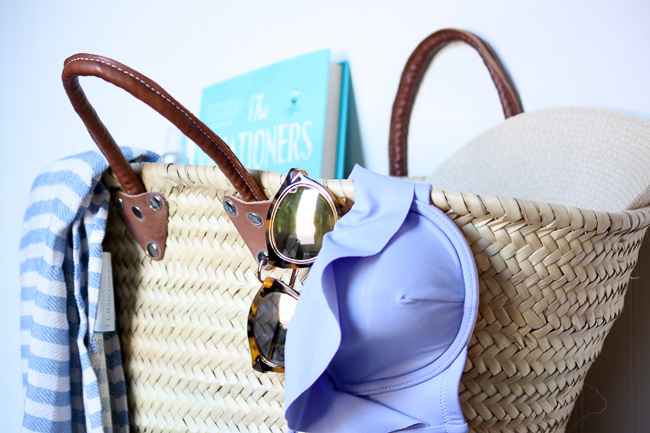 From my own personal experience of many summers days spent on the beach, there are some beach bag items that are absolute necessities. A towel is obviously a must have, but a cute one makes it that much better! 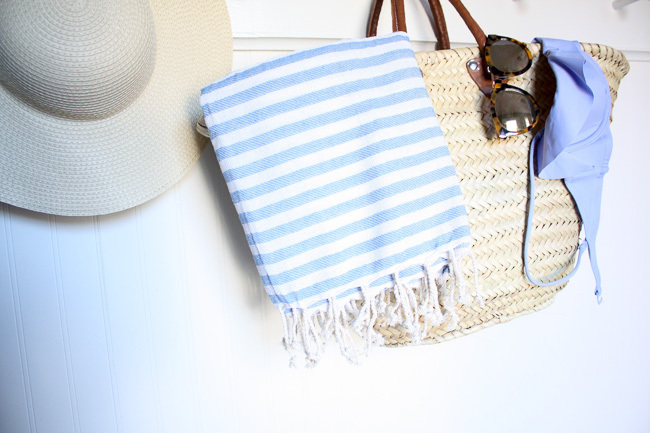 How cute is this striped Turkish towel!? 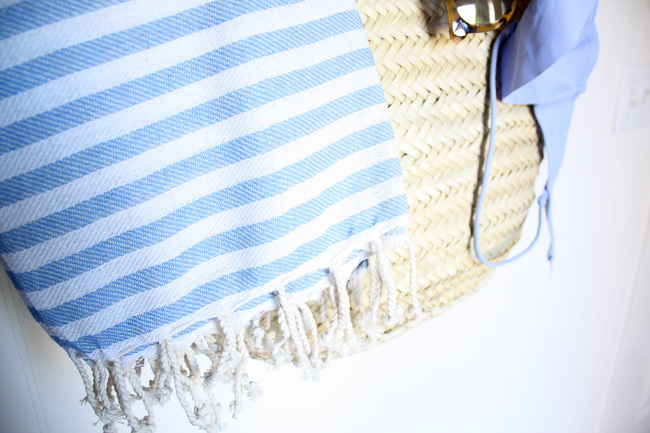 Perfect for lounging on the beach in style and light enough to easily be toted around in just about any beach bag. Of course when you're lounging in the sun all day, a hat is essential to protect your face or to just serve as a little break from the sun when needed! 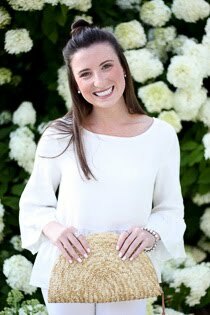 A good old baseball cap definitely does the trick, but a floppy straw hat is such a classic that you just can't go wrong with. Speaking of protection from the sun, a good sunscreen is key. It's a girls best friend, especially if you are fair skinned like me! Nothing will ruin a vacation quite like a killer sunburn. I just picked up Supergoop! everyday sunscreen and I'm excited to give it a try next week. I'll keep you posted on how I like it! 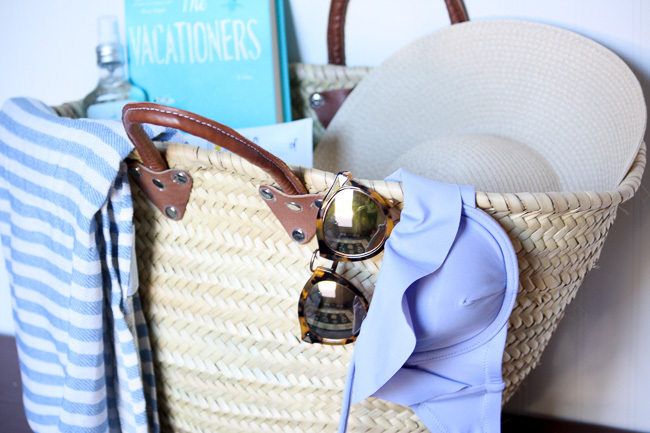 Grab your favorite pair of sunnies and a good book and you are all set to go! 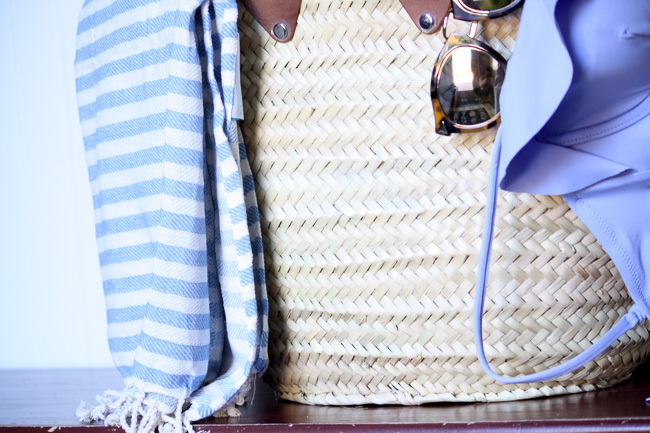 Of course you need a great beach bag to tote around all of these beach essentials, and with so many good ones out there, it can be hard to choose! 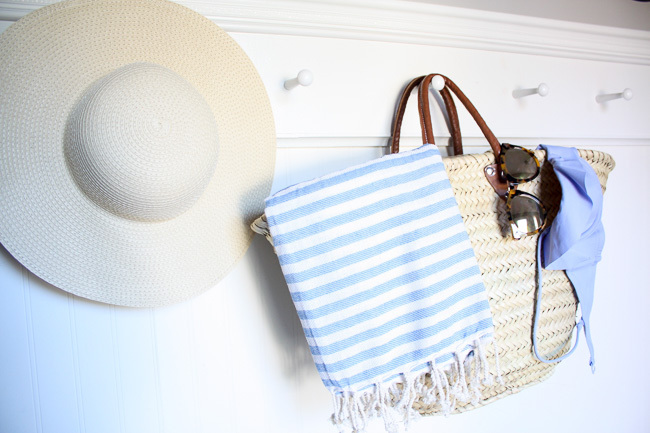 As you can see in the above pictures, a straw market tote makes the perfect beach bag. I got mine at an outdoor market in the French Riviera (I'm in love), but there are so many similar ones out there, that don't require a trip to France! 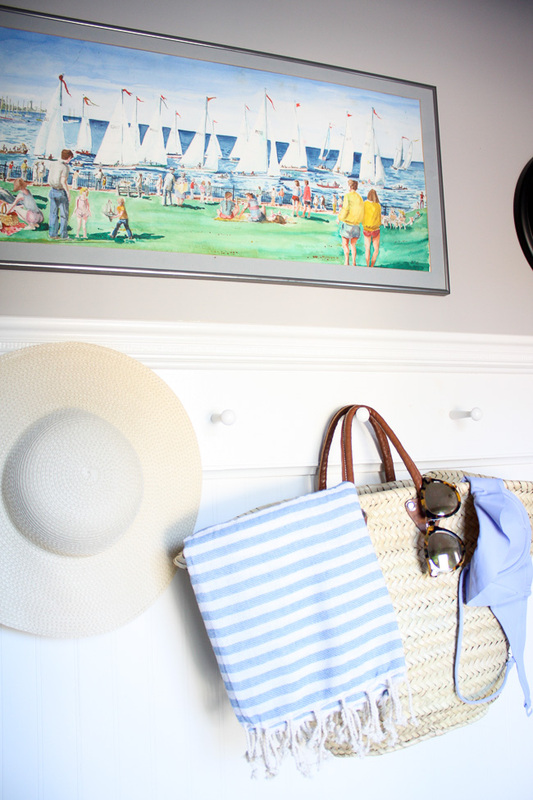 Another favorite beach bag of mine is my L.L.Bean boat & tote. I have it in the large size, which I assure you fits all of your beach going needs and also doubles as the perfect weekender bag. Definitely a bag I recommend adding to your collection! 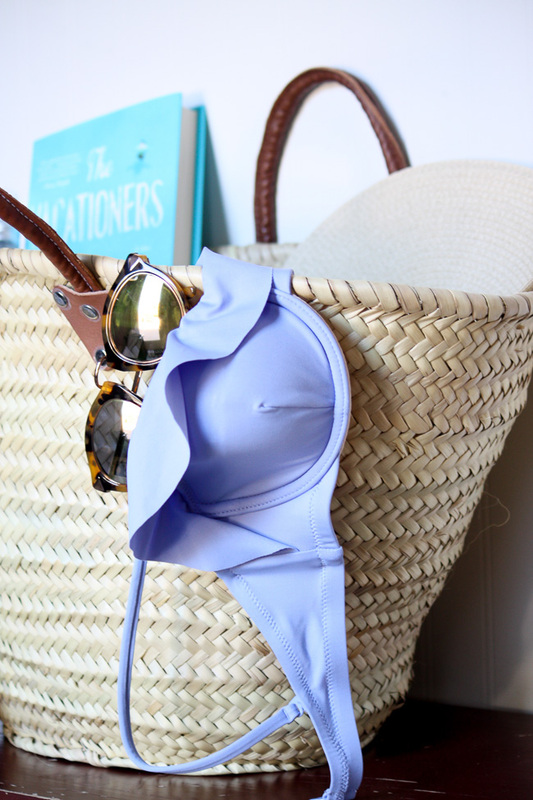 With the perfect beach bag to carry around all your beach essentials, all you need is a sunny beach somewhere warm! I hope that you find your way there sometime in the not so far future, and with you you bring all those perfect beach necessities. Enjoy and don't forget to soak up all the sun! I Spy Pink & Blue Swimwear! What's In My Beauty Bag?